If you've ever been to Kanata, Ontario, you'd know how quiet it is. So, Beth’s family quickly became known as the bagpiping family on the corner with the pub in the basement. Beth is the the fourth person in her family to play the pipes. It made complete sense. Beth started out as a highland dancer, and seeing that her brothers and father all played the pipes, it was only a matter of time and growth before she started playing. Beth felt like she was running to keep up; the boys had been playing in the cadets, and her brother Lochie had been to Edinburgh Castle for a course, so she didn't have the same opportunities. What Beth did have, though, was a brilliant instructor who taught her well, and taught her more about life, strength, and perseverance than anyone else. Morag Jamieson was and still is her mentor. Morag is one of the best, and everyone who's ever known her will tell you the same. Beth attended the summer school of the College of Piping in Timmins, Ontario, where she was very fortunate to meet and take instruction from such piping luminaries as Pipe Major Harry McNulty, Seumas MacNeill, James MacIntosh, and Murray Henderson, and with seminars taught by Bert Barr and the immortal Alex Duthart. Beth soon grew interested in drumming, which she learned later on. At Beth’s last summer at the college she was asked to teach, and Beth and her sister both won scholarships to the school. Being her first foray into the world of 'pipe majoring', it opened up a new world for her. Beth took the band to Scotland to compete in the World Pipe Band Championships in 2003- the first time since 1974, again each summer after that and in 2005 the band saw a magnificent opportunity in the band's performance at Balmoral Castle for Her Majesty The Queen and Princess Beatrice. The band and dancers put together a champion 40 minute show which was met by great approval by Her Majesty, and it was a terrific day for the families and guests who attended along with the performers. 2006 saw the band returning to Scotland and included a show at Belfast City Hall as part of their journey. Culloden, Inverness and Loch Ness were on the agenda, as were a performance at Edinburgh Castle, the Palace of HolyroodHouse and Caledonian Brewery. In 2007, the band played once more at Edinburgh Castle and the Palace of HolyroodHouse, at Drummond Castle for the 75th Anniversary of the charity Blesma, and took time to stop in Dunblane where some played the lovely tune written by the House of Edgar Shotts and Dykehead Pipe Major Robert Mathieson 'The Bells of Dunblane' in honour of the tragic events of 1996. The band also performed on behalf of the Lothian Bus Company, and played at some great venues for their friends at the Caledonian Brewery. Expanding on membership both in Canada and Scotland is constantly happening, so world-class instruction and constant support is key to further development. Bringing instructors to Ottawa from Scotland and Toronto are always in the works, as are return trips to New York City, Scotland and the US. The Sons were the first pipe band to ever play at legendary rock club CBGB's in New York City in April, drawing a huge crowd of spectators who were in disbelief of the volume!!! 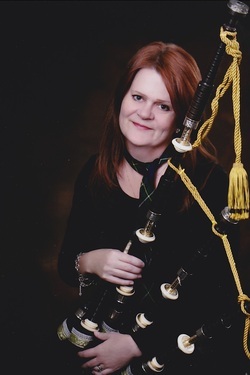 Beth has been a soloist or participant on 15 cds including her newest - a compiliation cd titled '25' released October 19, 2011, with a portion of the proceeds going towards her school ,and took part in the Bravo documentary 'They Pipe Among Us' featuring piping comedian Johnny Bagpipes. The Sons of Scotland pipe band also performed in support of the ACDC tribute band Great Scott, of which the Pipe Major was the rock band's piper, and she also plays with local rock band Royal Ottawa. Beth has also acted as producer of the annual 'Scotland Tonight', 'B in the Park' and the National Tartan Day events, and organizes special events of interesting and historical significance for the band. 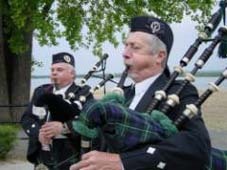 Shows at the Canadian War Museum, being the piper for the National Citizenship and Immigration Ceremonies here in Ottawa, and playing for rockstars is what helps keep this game of piping interesting! Beth teaches fulltime and is a highland dance piper and lead drummer in the Sons grade 5 band. 2013 was another exciting year with many great performance opportunities, a return trip with the band and many guests to Balmoral Castle in their 2nd private performance for Her Majesty The Queen in August as part of their annual journey to Scotland - and shows at Blair Atholl, Stirling and Edinburgh Castles along with the Palace of HolyroodHouse in Edinburgh will complete their agenda, after competing at the World Pipe Band Championships on August 18, at Glasgow Green. Bethany has also just received the Queen's Diamond Jubilee Medal for her work in the Scottish community. And just when you thought it couldn't get nicer, the band accepted an invitation to play once again for Her Majesty The Queen and the Duke of Edinburgh at Balmoral Castle as guests of the Canadian Massed Pipes and Drums in August of 2015. It was another amazing opportunity that a lot of people got to enjoy! As Director of the Ottawa City Piping College, she has now branched out to have 2 other Ottawa pipers join her as tutors following the College of Piping curriculum and she is pleased to be able to provide tuition to people all across the Ottawa region. A youth band opportunity is coming soon, and cadet work is now part of her week - and it is truly a wonderful, rewarding experience! Her site at www.championbagpipes.com offers a lot of information on music, travel, and so much more - go visit it too! Band Manager Bob Derry Bob, a high school Latin and French teacher, has been a stalwart member of the Sons of Scotland since 1993. In addition to being the Band Manager, Bob is a competitor in the Grade 4 band, a star in the film 'They Pipe Among Us', and a terrific contributor to the band's music. Bob is the one man who keeps the band organized, in step, and always contributing to our community with a great sense of humour and much kindness. My father was a piper, and on many a school night I vainly attempted to get some sleep while pipes were blasting in the basement. One afternoon I went downstairs and saw the odd looking octopus in tartan pajamas lying on the work table. I blew some air in the blowpipe and watched it get fat, then did C.P.R. on the bag before it deflated. Scared the hell out of our 2 corgis that followed me downstairs. It was so funny I had to do it again. My dad came down to investigate, and construed my dog scaring as a fervent desire to learn to play bagpipes, and promptly shipped me off to Morag Jamieson for pipe lessons. This was 1976, I was 12, and she scared the hell out of me. (good Pipe Major material) I then met and got lessons from Seamus MacNeill from the College of Piping, who was even scarier (is that a word ? ), and they both taught me that you must focus on the basics, and get them right, or you'll get nowhere. To any new piper wanting to join the band, there are a few things to remember...and I remind myself daily. Rule #1, The Pipe Major is always right. Rule #2, Focus on the basics and get it right. Massacre Jigs on your own time. Megan began her career in highlandry in the same way her brothers and sisters did, as a highland dancer. When the time came for her to do other pursuits, she took to drumming. In her early days, Megan can count among her tutors Sheila Jamieson, John Kerr, Harry Madden, Alex Duthart and Bert Barr. She travelled to the Timmins Summer School where she learned a lot over the summer sessions, and won the scholarship for drumming one year. She has been a member of the Ogilvy and Sons of Scotland Pipe Bands, and is now proud that her daughter is in the band too. She works very hard at supporting her corps and being a stalwart and hardworking teacher and band officer, and the band is proud of its success under her direction. Australian Championships, all in the fellowship of a wonderful group of people. In 2009, we headed back to Canada, with a detour to accompany our Queanbeyan mates on a band tour through England, Scotland and Ireland, before sadly bidding them farewell and turning west. Back in Ottawa, the Sons of Scotland Pipe Band accepted me into the fold and I’ve since had the pleasure of continuing my piping experience with a whole new group of great people. Among the great times was the first time piping in Massed Bands at Maxville, an event I watched many times. Piping has brought great joy to my life and I’ve been grateful every day (well, except the days my fingers don’t work or the pipes decide to be unco-operative) that I finally took the plunge. It’s never too late! 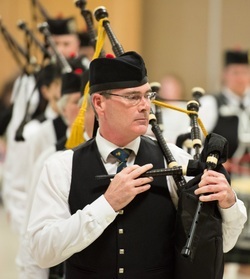 Darren is proud to be associated with the Sons of Scotland Pipe Band and is the fourth Sons' member of the family after his wife Gwen, daughter Alison and son Russell. After a stint as roadie/drum sherpa and part-time band photographer, he has shifted duties, putting his cadet band colour party experience and love of "the pipes" to proper use. When he is not managing technology projects or working on his next book, he shares the role of band Drum Major, although still doubles as Snare Drum Sherpa when his services are required.